Market Update - Did you see the July Market Correction happening? The non farm payroll result was better than expected, 222000 vs 179000 expected, market was pushed up by this news as it firms up the "one more" rate hike in 2017. Last week Hang Seng Close below 25500 support level making a 1 month low, looks like we are in a correction. Gaming and Technology sector turn weak. Over the past 2 days, we see them turning around, Galaxy Ent 0027.HK & Tencent 0700.HK still uptrend stock, turning up now. China Stock market is strong last week, making it's recovery back above 3200, now is 3190 hovering around this area. It could be due to the China A Shares MSCI inclusion's news that boost investors to look into chinese stock market. Banking Sectors is strong too in china. 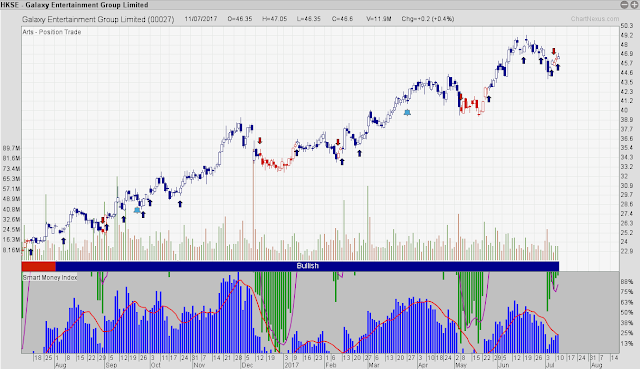 Singapore market also in correction period, STI is sideway trend since May, support at 3200 and resistance at 3280. Few month ago electronics sectors are the strongest among all other sector and we see that the electronic stock is rising higher in Singapore but now they are weak after global market electronic stock had a correction. Now the stock and sector that support the market is Bank, Property and Reits. Reits is strong right now due to 2 reason, firstly Market is not moving, investors prefer to put in high dividend reits than to put in the bank as interest rate is low. Secondly, Fed already increase the interest rate for 2 time in 6 month, means there is only likely to have 1 more interest rate hike in the second half of 2017, fear of interest rate hike is lesser now. Right now for Singapore, high dividend stocks and bank stock are the strong sector. Malaysia Market also in correction period, our favorite stock like Penta, VS, Prestar, Dufu, JHM, Gkent and many more are weak now. If these strong stocks are still not moving higher.